Oh yes! Oh yes! The long wait is over and we can finally say: we’re going to DreamHack Summer 2015! The 16th edition of Intel Pack4DreamHack is a go! And this summer promises to be bigger and better as DreamHack always does. More e-Sports (with CS:GO leading the pack), more cosplay, more music and even more fun! And of course, we as the people from the Benelux cannot miss out on all of this. That’s why we’ll be going to Sweden once more with a tour bus full of enthusiastic gamers, e-sporters, freelanners and videocrew to play games, enjoy the e-sports, have a bunch of fun and of course report back to everyone here about the crazy adventures we have. And the best part? You could become a part of Intel Pack4DreamHack and join this crew of crazy Dutchies and Belgians that go to DreamHack! By simply signing up here, getting picked to join the team and paying the sum of € 149,- you’ll be one of the gamers that will have amazing stories to tell about this crazy gaming event. Not only will you have the stories, but most probably you will also have made a bunch of new gaming friends, have a bunch of goodies to remember your awesome trip (including a shirt that reminds the world that you are a Packer) and probably you’ll even learn some Swedish words on the way. 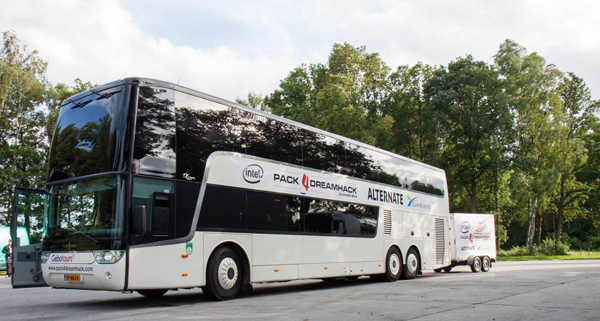 Intel Pack4DreamHack Summer 2015 will start its trip on the 12th of June, with pickup points near Eindhoven, Utrecht and Enschede. From there on out we’ll travel through Germany, Denmark and Sweden itself to eventually end up at the Elmia Halls in Jönköping. There we’ll have a full row of tables available for you to set up your own computer, play games all weekend and enjoy all the e-sports, mainstage events and activities that DreamHack has to offer. We’ll return back to the Netherlands in the early hours of the 17th of June. Please be aware that, as always, there are limited spots available on the trip. Sign up quickly and if you are going with a group of friends don’t forget to leave a clan name while signing up. What are you waiting for? Sign up here to join the best gaming trip this world has to offer.